Industrial Equipment Manufacturers have to connect closely with customers and introduce new products quickly and efficiently to meet their needs. While smaller Industrial Equipment Manufacturers may be able to control, access, and share product data with relatively simple Product Data Management (PDM) tools, larger Industrial Equipment Manufacturers rely on full-featured PLM systems that help automate processes and share data across global supply chains. They need to choose a system that quickly delivers the core capabilities they need to streamline product development but also gives them room to grow value over time. 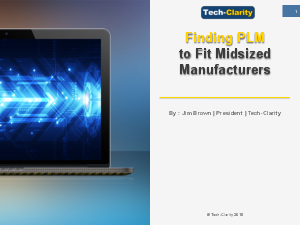 What’s the right size PLM to fit an Industrial Equipment Manufacturer? Let’s take a look.